We’re coming up on the last few days of January, which means it’s time to reflect on what I’ve learned in the past month. I have to admit, I’m a little nervous about sharing this list, and here’s why: there are some months when I’m super excited to share what I’ve been learning—lots of deep and heavy insights, fun trivia, crazy aha! moments. But this January hasn’t proven to be one of those months. That’s not to say this list isn’t interesting or that you shouldn’t read it (I hope you will!) but it’s not where I expected my mind to be at the start of this new year. I’ve been doing a lot of deep thinking lately—more than usual for a January, as autumn seems to be my most contemplative season, and winter is usually more laid back—but despite all this brooding reflection, I haven’t arrived at any conclusions: most of my current learning is still in process . . . and that’s okay! 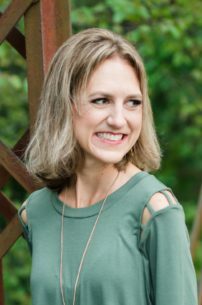 I can’t dictate the amount of time it takes me to learn a lesson any more than I can pick which truths God is teaching me at any given moment. But a side effect of this slower pace is that much of what I’m learning right now is still too raw to share, so this list is sightly above the surface of what’s been going on inside of me lately. And . 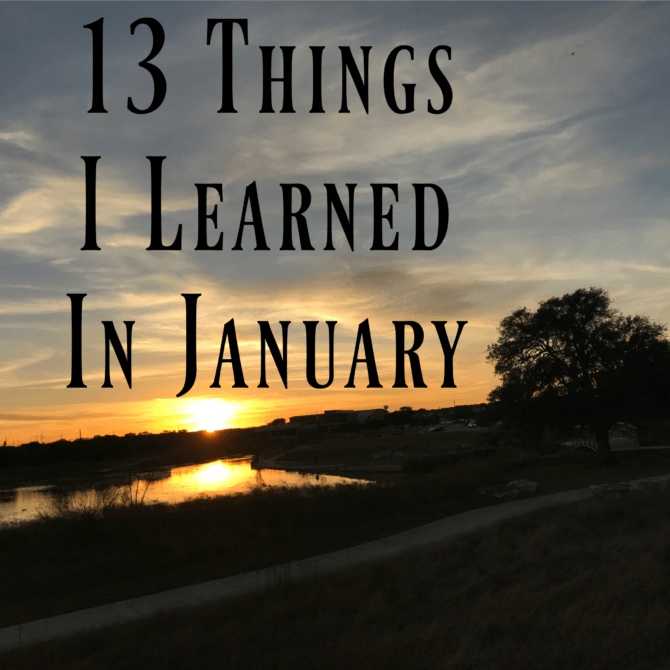 . . with that less-than-stellar (but totally honest) introduction, here’s a snapshot of a few things I learned this January. I listen to a lot of audiobooks (in fact, they made up two-thirds of the books I “read” last year) so I was very interested in this article which claims that “as far as the mental processes are concerned, there really isn’t much difference between reading and listening to a book. One is not more work than the other.” I personally have found that I enjoy, appreciate, and remember more of the books I read over those I’ve listened to. However, the convenience of audiobooks keeps me listening, so it was nice to have my auditory reading habit validated. 2. Audiobook narrators make a lot of reading mistakes. I usually read a book or I listen to it, rarely both at the same time. But as I shared on Wednesday, I finally made it through Little Women by listening to the audiobook while following along on my Kindle, and it was an enlightening experience. I was surprised by how many reading errors were made by the narrator: word reversals, ommited or rearranged sentences, and even some word replacements. I’m curious if this is common, or if it was a quirk of the particular book/edition I listened to. It almost has me wanting to do more joint reading/listening just to find out! 3. The average “binge time” for the first season of a television show is less than a week. I consider the way Luke and I watch TV as binge watching, since we watch one show at a time and watch it from start to finish; but we only make it through one or maybe two episodes each night, so it takes us far longer to get through a season than what is considered a true television binge. This interesting post includes a roundup of the average time people take to watch different types of shows on Netflix. Not surprisingly, subsequent seasons are consumed even faster than earlier ones. 4. Charleston is becoming a girl’s name! 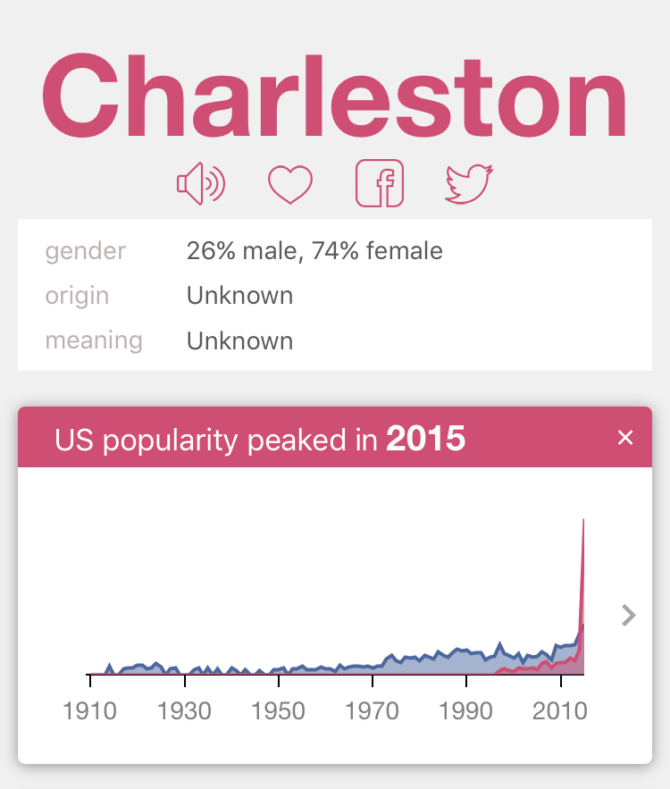 A few weeks ago, a friend commented on how much she liked the name Charleston—for a girl! I (shockingly!) hadn’t looked up the most recent statistics on the name, and was amazed to find that in 2015 (Charlie’s birth year), Charleston was given to 87 boys and 253 girls! This was a sharp spike from the previous year (71 boys and 40 girls) so I think—hope!—it’s just a fluke. We specifically chose Charleston because we wanted a strong, masculine name . . . .
5. Eggs do not need to be refrigerated in Europe. The reason, according to this article, is that many European countries vaccinate against Salmonella Enteritidis, which can infect a chicken’s ovaries and contaminate the yolk. In the United States, eggshells are washed and disinfected, which kills any bacteria that might be on the outside, but not the bacteria inside the yolk. I’ve always kept my eggs in the fridge and had never considered doing differently. 6. Sleep deprivation can be used to fight depression. This seems totally counter intuitive (doesn’t exhaustion contribute to depression?) but the explanation makes sense: people with severe depression often have irregular circadian rhythms, and these can be realigned through periods of prolonged wakefulness. 7. Studies have shown that Major League baseball players have exceptionally good eyesight. I read this intriguing statistic in a James Clear article dispelling the myth that greatness is purely the result of deliberate practice. Genes play a huge part (as seen in the ocular advantage of successful ball players). However, Clear is sure to point out that “genes provide opportunity. They do not determine our destiny.” I love this! 8. I REALLY hate being cold. Those of you who know me in real life are probably laughing at me for including this on my list, because my loathing of cold weather is nothing new. However, I always forget just how much I hate the cold. When I’m basking in the heat of long August days, I am able to convince myself that the cold isn’t so bad and I just might be open to Luke’s desire to relocate to a chillier climate. And then the temperatures dip below 70 degrees (or the 20s like we’ve had this month!) and all of my bravodo vanishes faster than you can say frozen chicken! 9. I hate wearing layers even more than I hate being cold. I finally realized that this is the main reason I don’t like being cold. To stay warm in the winter I wear two pairs of fleece-lined tights under jeans, with wool socks and tall boots; I won’t even get started on how many layers I wear on my top half, not to mention scarves and hats and gloves. 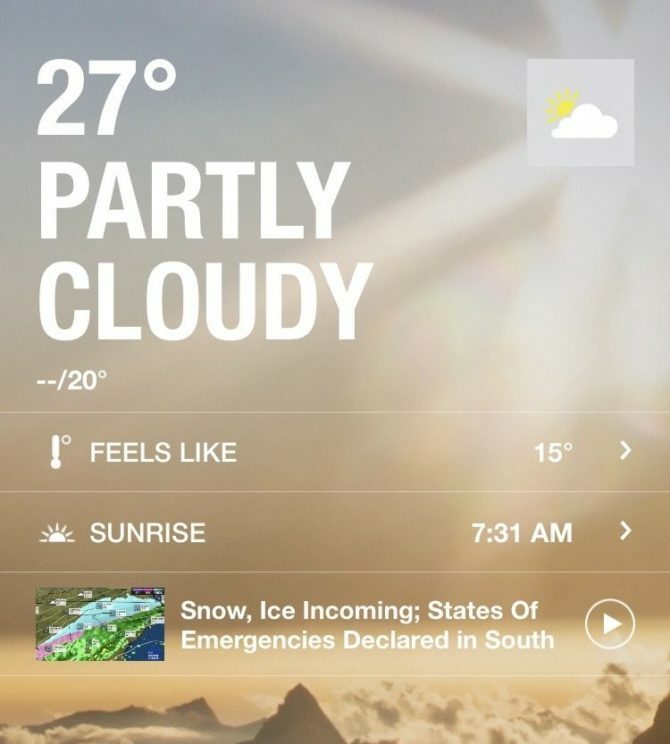 It’s nearly impossible for me to move in all those layers—no wonder I hate winter so much! I’m starting to think I might be better off with slightly fewer layers; I may feel cold but at least I will be able to bend my arms and knees! 10. Charlie’s birthday (January 16) is also Hot and Spicy Food Day. This might explain his very high tolerance for spicy foods. And here I thought it was all the hot sauce I ate when I was pregnant! 11. Birthdays make me sad. Well, not every birthday, mostly just Charlie’s, because it forces me to accept how quickly he is growing and my inability to slow down time. I felt this way when he turned one and again this year on his second birthday. Once the day itself passed I started feeling much better, and I’m now just focusing on enjoying TWO! 12. Anxiety and insecurity pop up at the strangest times. 13. 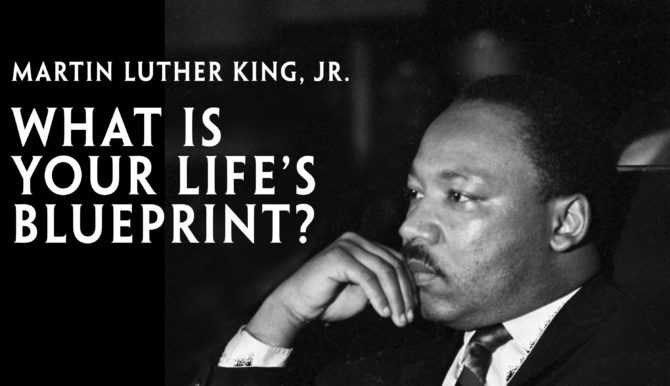 Martin Luther King, Jr., was only 39 years old when he was assassinated. I’d always imagined Dr. King as a much older man and was shocked to learn this fact. It’s inspiring to think of how much can be done with such a short life, and also a little disheartening as I think of how little I’ve done in my own 32 years (cue those pesky insecurity triggers from #12; ay ay ay!). And there you have it: my incomplete, but still relevant and meaningful, list of what I learned in January. What does your list include? ← 2017 Reading Challenge: A book written before 1900.